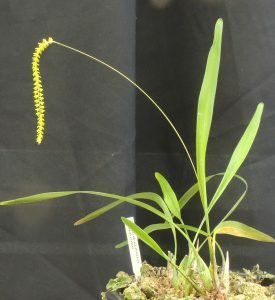 This is one of our smaller Dendrochilum species that in common with most of the genus produces a pendant spike of delicate little fragrant flowers. The species is native to the Philippines where it grows from 660-2250m altitude. We find that our plant does best cool and damp in our Cool Americas section (yes we know the Philippines isn’t in the Americas) as it enjoys the conditions we provide for our Masdevallias. 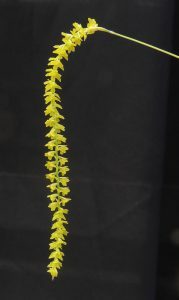 It is nice to have it with us at the Bristol University Bee and Pollination Festival as the species like many orchids is pollinated by tiny midges and not by bees that get all the credit and the festivals – though would anyone go to a midge and pollination festival?